Blue lupine is just one kind of lupine, but, for native-plant enthusiasts in its native range, it holds such great significance that its botanical competitors are scorned. This importance is not limited to horticulture. Find out what all the fuss is about, plus learn how to grow it in your garden. 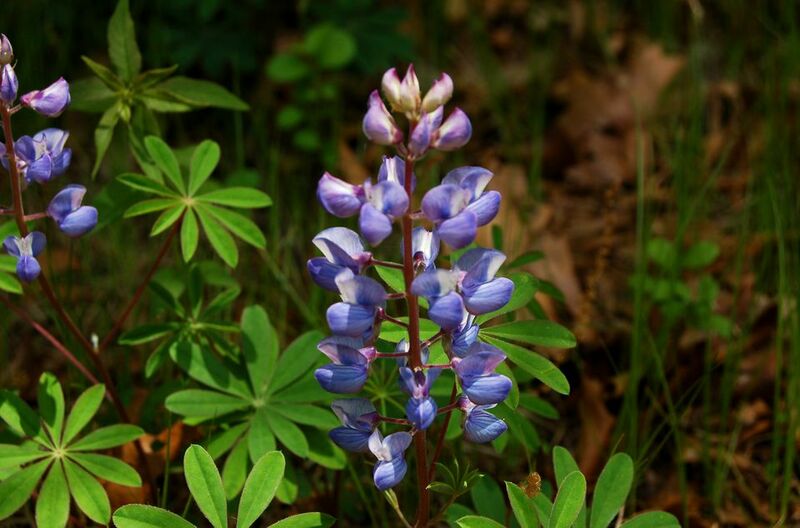 Also called "sundial lupine," blue lupine is the common name for Lupinus perennis. These flowers are herbaceous perennials and members of the pea family. As such, they are nitrogen-fixers. Identification: What Does the Plant Look Like? Spiky blue flower racemes (4 to 10 inches tall), which bloom in late spring or early summer, are the hallmark of this perennial, which can grow as high as 2 feet. It is smaller than its introduced rival, Lupinus polyphyllus. Of this lupine's foliage, Lawrence Newcomb, in his wildflower identification guide, writes, "Lower leaves with 7 to 11 leaflets 1 to 2 inches long" (p.66). Because of the appearance of these palmate leaves, the plant is moderately attractive even when not blooming. Lupines, having long taproots, are one of those fussy plants that dislike being transplanted. For this reason, it is better to try to establish them by seeding. Allan Armitage observes that lupine flowers "love the cool weather, hate the combination of heat and humidity...." (Armitage's Garden Perennials, p.198). That's why, although blue lupine is listed by many authors for planting zones 3 to 9, that range is probably somewhat deceiving. It may technically grow as far south as zone 9, but it will perform better in the more northerly reaches of that range (zones 3 to 7). This perennial's hatred for heat and humidity explains its preferred light conditions: In the North, locate blue lupine flowers in full sun, but, the further south in its range you go, the more it makes sense to grow it in partial shade. Provide your plants with well-drained soil, leaning toward the acidic side in terms of soil pH. Due to their nitrogen-fixing ability, they don't need you to supply them with a lot of nutrients; in that sense, they're not fussy. But they are, indeed, fussy about the drainage requirement, so if you have clay-rich soil, make it more friable by working in some humus. "Wild" Is Not Synonymous With "Native"
There is a type of lupine (Lupinus polyphyllus) that grows wild all over northern New England. You can't miss it in spring when it blooms. Large stands of it, in mixed colors, line the roadsides. Maine, New Hampshire, and Vermont even celebrate lupine festivals in recognition of this plant's beauty. New Hampshire's (held in Sugar Hill, in the White Mountains) is the best known of these. While it may be beloved by many, some of the more doctrinaire plant-lovers have an open disdain for it. To understand what objection they could possibly have against such a beautiful wildflower, you must appreciate the fact that not all wild plants are native plants, and the lovely specimen that has enthralled New Englanders enough to spawn festivals in its honor is actually not native to the region. This alien lupine has the gall to hail from western North America (it is blue lupine, Lupinus perennis, that is native to eastern North America). You butterfly aficionados may have heard of the Karner blue butterfly (Lycaeides melissa samuelis). The Michigan Department of Natural Resources (MDNR) reports that it is on the federal government's endangered species list. MDNR goes on to say that its larvae feed only on blue lupine plant's leaves and flowers. The reduction in the population of Karner blues is directly correlated to the dwindling numbers of blue lupines across much of their native range.